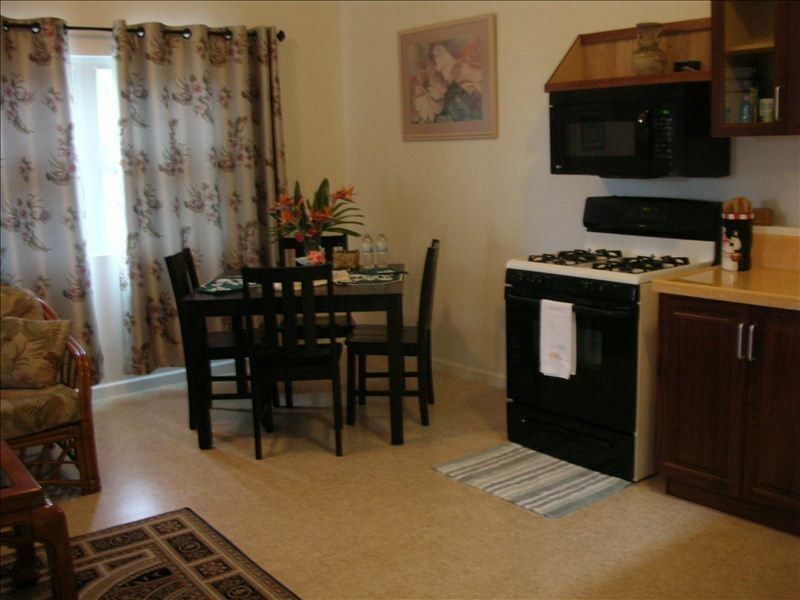 Our guest units are on 4 acres over looking the Kona Coast, on the slopes of Mt. Hualalai. 10 min. to pristine white sand beaches and world class fine dining at the Four Seasons Resort Hualalai. Sweeping ocean views with cool tropical breezes at 1000 ft. elevation. Kitchen is fully supplied. These are brand new units. This is a smoke free environment for your enjoyment. Sorry no pets. If you are looking for a quiet place with a comfy bed, a kitchen to prepare meals, a view of the ocean with Continuous breezes flowing through the room, this is what you will find here. There are extra touches like fresh flower bouquet and band aids, after sun products, seasonings, olive oil and rice vinegar. The owners are non intrusive and friendly and told us about a few great beaches that the locals use and we went and it was beautiful. There is more like beach chairs and towels. Also a blender and plenty of pans to cook a gourmet meal. We are definitely retuning here to stay. Max was very helpful. He knows the area and is full of advice. The apartment had everything you could need. Books on the area, a cooler, beach towels (I hope the mud came out of them okay). There were games and DVDs which we did not use but they were available. Snorkel equipment was available to borrow. A bowl of fruit in the common area with a sign to help yourself, I believe this was all from the owner's trees. I felt very safe and secure there, on the second floor, we left the windows open all the time for the nice fragrant breezes. Would definitely recommend staying here. Wow! The Kona Palisades was a great place to make our homebase during our recent travels to the Big Island. Max and Della were great hosts! There were fresh flowers on the kitchen table when we arrived and outside leading to the guest units, they always left the guests fresh fruit from their trees. My husband and I loved that we were in a neighborhood but felt so secluded. Good distance to the main town of Kona and about 30 minutes away from our favorite beach we found. This place was perfect for just the two of us! Note to other travelers: washing machine is located under the stairs outside (we could hear the buzzer go off which was great when I needed to do laundry)- dryer is also down there but costs a buck to use - we just hung our clothes to dry in the condo. Thanks so much for a great stay and for being so nice and personable! We loved getting to meet you both and stay on your property. Della was a joy and we were very comfortable . Close to everything. Carol it was a pleasure to meet you. Hope to see you again soon. We had an excellent stay here. The apartment has everything you need, is clean and really quiet. The owners are around when needed but not "in your face" and are the nicest people. No far from the airport and Kona, ideal to come to after a day of exploring the island and relax. This review is only based upon contact I had with the owner before and after my booking this unit, as our plans changed at the last minute and we DID NOT stay here. My booking, 4 months in advance, was handled quickly with confirmation email timely. Pertinent info about the unit was received also in a timely manner. Once on the Big Island, our plans changed and we did not stay in this VRBO with the full understanding that we would not get refunded any of the nightly rent due to the last minute cancellation. Once I knew of our change in plans I notified the owner, this was 1 day prior to our check-in date. I asked if it would be possible to have any of the fees refunded since we would not be occupying the unit - VRBO fee and cleaning fee. I also asked if our security deposit could be refunded in a more expedited manner since we would not be occupying the unit. From this point on, email communication with the owner was not as timely as I would have liked. The VRBO fee was not refundable (understandable), but the owner was willing to refund the cleaning fee. From the day I notified the owner of our cancellation, it took 12 days to receive the check with the cleaning fee. From the day I notified the owner of our cancellation, it took 12 days for the security deposit to post back to our account. This time frame may very well be standard operating procedure for VRBO; however, they and the owner took my money right away when I booked. It is a bit irksome that an almost 2 week wait to receive monies owed with many emails to the owner, in my opinion, is not ideal. The standard for return of monies owed is 2-3 business days in today's business environment. The location is just a few minutes by car up the hill from the airport. Very convenient location. Instead of the security deposit you can give a cc# to be held until your departure There is a $50 cleaning fee for all stays Maximum 3 People.